Finished, the double file stops! 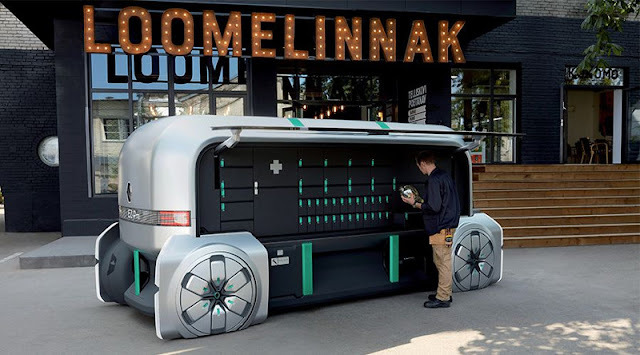 After the concept EZ-GO, autonomous diligence of the XXI th century, here EZ-PRO, an autonomous and silent delivery robot for the delivery of the last kilometer. There is a lot of talk about an autonomous shuttle intended for the transport of the person. But what about the transport of goods, especially in large cities where the trend is to restrict access to polluting and imposing vehicles? Some try to offer alternative solutions such as Piaggio with Gita (a robot caddy) or Toyota and its e-Palette, both still in the concept state. As for the American start-up Nuro, its R1 car is since last August in test phase in real conditions in the city of Scottdale (Arizona). This automated robotic shuttle delivers groceries purchased by individuals from a single store. Now Renault is interested in the issue as a utility vehicle specialist. After the presentation of EZ-GO, the autonomous and intelligent diligence of the 21 st century, last March, the French manufacturer unveils its delivery version, the EZ-PRO, at the IAA Commercial Vehicles Fair (Hanover). 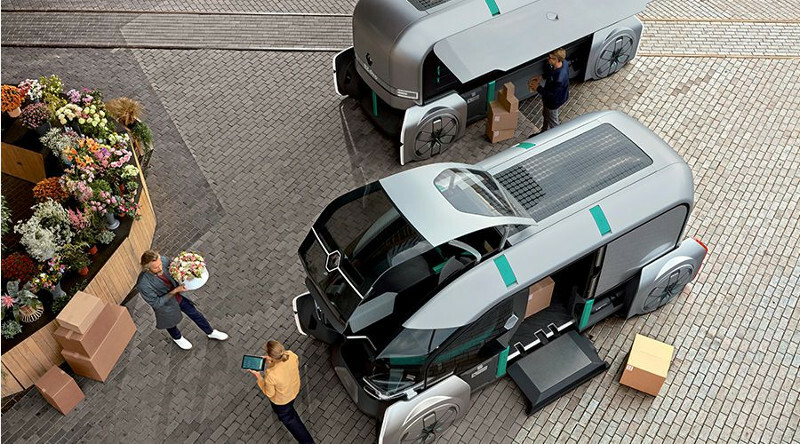 The EZ-PRO is a concept of "autonomous, electric, connected and shared robot-vehicle", also called pod. It has four steering wheels and a front opening. The EZ-PRO move in packs with a "pod leader" welcoming not a driver, but a concierge who does not drive despite the presence of a joystick. He is in charge of"To supervise and plan the route of robot-pods without a driver", according to Renault, which believes that "humans will remain for a long time at the heart of transport activities". As for the follower pods, they can move autonomously and follow their journey to destination. With its EZ-PRO, Renault wants to attract both professionals and end-customers thanks to the flexibility of use. Thus, the first will be able to program tour times and delivery locations, while the latter will request delivery by hand through the concierge. Another option for these users is to access the self-service lockers contained in the robotic pods at any time. The opening is done via the mobile phone. If the idea is attractive, still remains to find an economic model. Although in concept, the project seems to have attracted some professionals, such as the Patrick Roger chocolatier, the Piper-Heidsieck champagnes or Lomi coffees, according to Ashwani Gupta, Director of the Utility Vehicle. Image @renault.